The Highland Technology T165 Laser Pulser incorporates an edge triggered pulse generator with 150 picoseconds nominal rise and fall times into a butterfly or TO-packaged laser. The 2" by 2" design connects directly to Photodigm's standard 14 pin butterfly laser package, making it ideal for OEM use in laser systems. After evaluating a Photodigm 1064 nm DBR laser, Highland Technology reports: "Your laser made the cleanest, fastest sub-100 ps pulses of any of the butterflies that we've tested so far. The falling edge is beautiful, no lopsidendness or post-pulse artifacts. Nice laser..."
Photodigm’s DBR seed laser diodes provide excellent spectral stability and high power for pulsed applications. These lasers are capable of producing pulses as short as a few 10’s of picoseconds and can exhibit a high degree of spectral stability, required for a seed laser for high-gain fiber amplifiers. These short pulses are obtained through the process of gain switching. Gain switching occurs as a large number of carriers are initially pumped into the active region of the laser. Once the laser is pumped above threshold, a surge of stimulated emission depletes the carriers faster than they can be injected, resulting in a very short, high power spike -- the gain switch spike of the pulsed DBR laser. 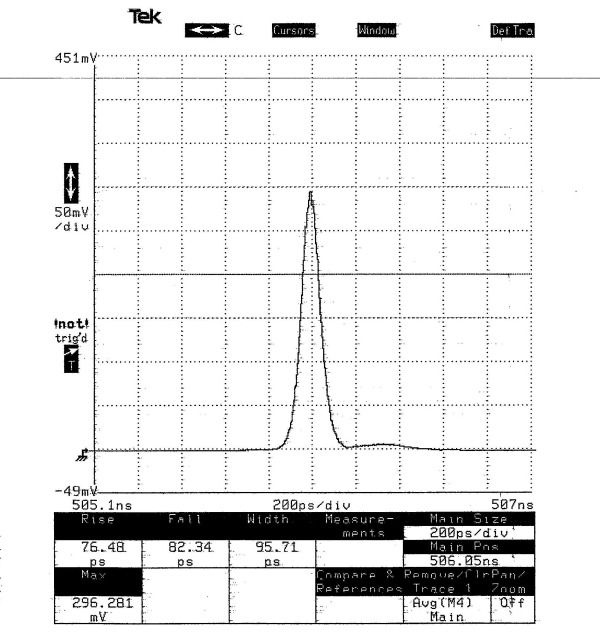 Trace of 100 psec pulse of Photodigm 1064 nm pulsed DBR laser made with a Highland Technology T165 Laser Pulser. Please contact Photodigm for more information regarding OEM and end user applications.